Lemonade Berry shrub is a common sight among mixed inland and coastal Chaparral. 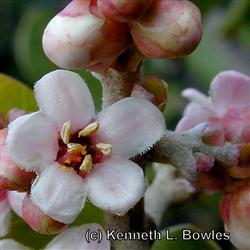 These shrubs can grow into small trees and develop long, citrus -like leaves that accent small red and white flowers. Lemonade Berry is an important evergreen shrub to use as a foundation in any landscape that does not experience frost. These shrubs are home to small mammals and bird life, that find its curving branch architecture ideal for nesting. The flowers were historically used in teas and tinctures as lemon flavoring.